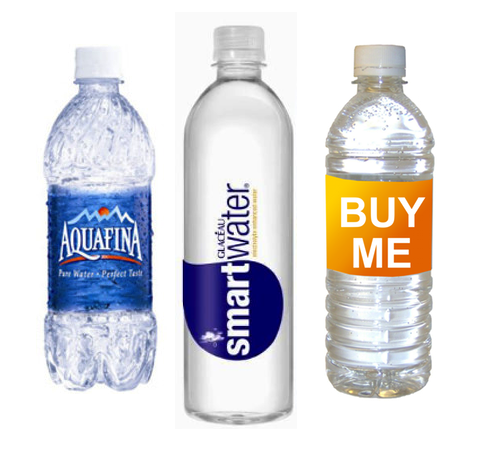 When it comes to branding your bottled water, the conversation is short: "make the label blue and swirly, please". I imagine that sky blue swooshes test well, that they get us thinking things like "refreshing! ", "clean", "wayy better than tap!". But when the entire 7/11 refrigerator is filled with blue bottles, the value of "that looks refreshing!" will likely be outweighed by "what is that wild-eyed, crazy-colored bottled water?!" Try yellow, which kissmetrics says is a born attention-grabber. Stand out from the sea of brands trying to remind you of the sea.